Connects to mobile phones for dialing from rooms without an analog phone line. 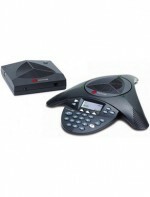 Connects to a PC to become a high-quality conference phone for Internet calling. Software upgradeable for investment protection and adding future audio conferencing features. Up to 10-feet (3.5-meter) of 360-degree microphone coverage. SSW EX (Expandable) better Pick-Up for larger size conference rooms. Wireless freedom and flexibility combined with superb voice conferencing performance. 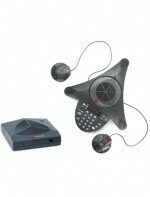 Connects to mobile phones for dialing from rooms without an analog phone line, and connects to a PC to become a high-quality conference phone for Internet calling.